Book a complimentary consultation and discover the possibilities for your special event. 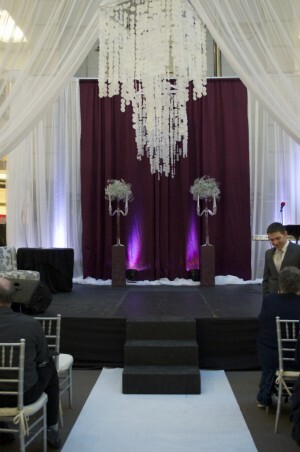 We specialize in full service wedding and event decor. 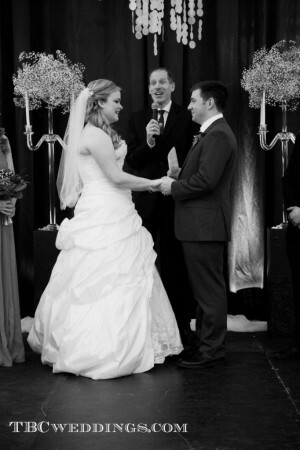 Our attention to every detail will ensure your wedding is everything you have envisioned. Our service area includes southern Vancouver Island - From Duncan to Port Renfrew, Sooke to Sidney and Victoria. We also serve areas off Vancouver Island. Please inquire for pricing. Contact us today to reserve your wedding or special event. Congratulations to Charlene and Peter !!!! So now that the dust has settled…ummm yes this is literally speaking. En Vied was once again honored to decorate for the second annual Modern Bride Show, put on by the best team Lonnie and Jordan from Just Love Animals Society. This post is long overdue, especially since Modern Bride 2015 is currently in the works as we speak. 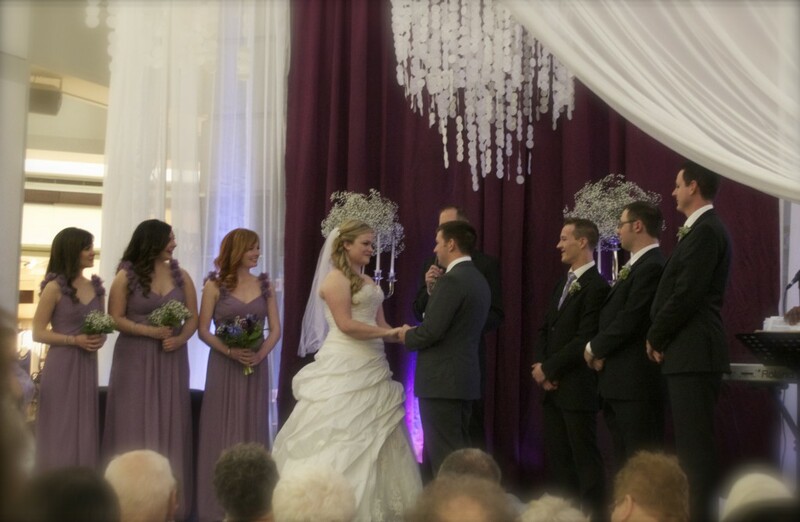 Nevertheless here is the live wedding hosted by Just Love Animals at The Bay Centre. 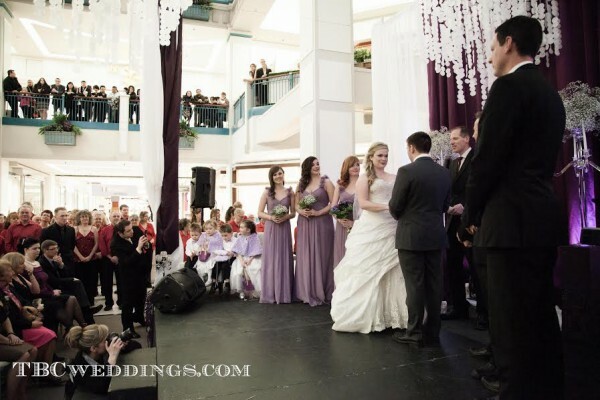 Yes right in the middle of the mall smack dab in centre court, a LIVE wedding. And En Vied gets the privilege again for 2015 to create a Chapel for this years event! The concept for this wedding was started 9 months before…so this is my baby 🙂 I knew it had to be grand especially working in the centre court of a downtown mall. I envisioned large hangings to work with the height of the space but to also bring some definition and create a “ceiling” as the ceiling extends some 4 floors up. This is where I decided to give some visual interest to the ceiling portion of the chapel and undertook months of preparing these large 4′ faux capiz chandeliers. After thousands of hand cut circles, and stringing them together to make a 5 foot structure, I was so exciting the day of to actually get them hung and see how they would look in the space. The day arrived and has since past and I am currently making a new chandelier concept for this years show. Here is a picture from last year, the challenge now is to change it up and keep topping what the decor was from the year before. 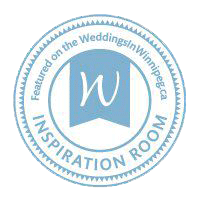 I will leave this post with some lovely words by the bride, and please be sure to check in soon we have some exciting news about a space we will be using for advertising for the next wedding!!!! Really over the moon excited about this!!! And here is one of my favorite testimonials, I love when brides love their decor and even more when they appreciate the amount of hours involved in creating custom weddings and events.